To find the right Ko Phi Phi resort is key to having that perfect stay on one of Thailand’s most loved islands. This top 10 destination is magically beautiful and busy around the main pier so getting the right beach or budget does require a bit of planning and awareness to make a memorable holiday. Nearly all accommodation on the beachfront comes under the description of a Ko Phi Phi resort except the Phi Phi Island Cabana Hotel. However the Phi Phi Island Cabana Hotel is one of the island's top 4 star resorts and straddles the 2 sublime beaches on Tonsai Bay and Loh Dalum. The beachfront Ko Phi Phi resorts vary from the luxurious 5 star Zeavola Phi Phi Resort to the simple yet popular budget Phi Phi Hill Resort (only open November to April, rates appear very late). In between these 2 extremes lies 17 beachfront resorts of all level of facilities and all budgets. The Zeavola Phi Phi Resort is the only 5 star Ko Phi Phi resort with unparalleled service and accommodation in the far north of the island where it is quiet and peaceful. The 4 star Holiday Inn Phi Phi Island and Outrigger Phi Phi Island Resort and Spa (previously Phi Phi Island Village Resort And Spa) offer superb beachfront accommodation and more diverse facilities than the Zeavola Phi Phi Resort and are on the Laem Tong and Loh Bagao beaches respectively. 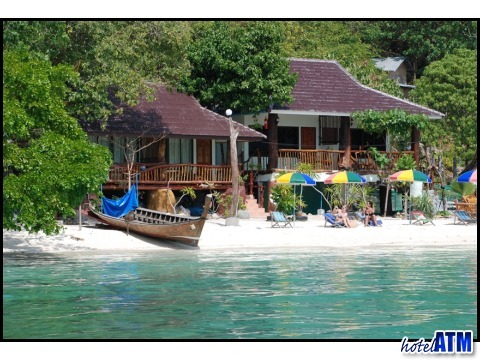 The best mid-range Ko Phi Phi resort can be found on this link mid range Phi Phi Resorts. The Phi Phi Relax Beach Resort, Tohko Beach Resort, Phi Phi The Beach Resort in Pak Nam beach are remote and an old fashion beach and paradise experience. The Viking Natures Resort, Phi Phi Paradise Pearl, Paradise Resort are popular Long Beach resorts with views out over to Phi Phi Ley and just a 5 minute longtail taxi boat ride to the village. A Ko Phi Phi resort on a budget gives you a wide variety of simple accommodation. The Phi Phi Hill Resort is already mentioned but the fan rooms at the pool Phi Phi Viewpoint Resort overlooking Loh Dalum bay are good value. The Phi Phi Popular Beach Resort is well liked and sits beneath the Tonsai Towers and over looks Tonsai Bay and the start of the coral reef. Phi Phi Popular Beach Resort is a micro resort and the few rooms can booked well in advanced. All the islands best deals and cheapest prices can be found at Phi Phi Hotel Deals where all the Free Night Specials, Fixed Night Promotions, Special Discounts, Early Bird Offers Honeymoon offers are listed. HotelATM.com with phi-phi.com can offer a free night for long stays and this information can be found on each hotel fact sheet page on the Free Night Specials link on the right navigation.